In this era of streamed music and music player apps, there's more but only when we tap into its full inherent power. Music was invented by a community, for the community. A nation has its national anthem. A school has its school song. Even couples have one they call "our song". 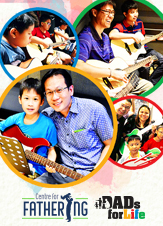 In this workshop, you will learn how music can unite families and help you connect with your child on a deeper level. This workshop is recommended For Dads, Mums & Kids (8-16 Years). Receive BM$20 by attending this workshop. BM$ can be used to offset future course fee payments.